Sri Lanka’s Peoples’ Leasing Company (PLC), the island’s top vehicle financier, plans to raise more than 500 million rupees through Shariah compliant asset-backed securities, officials said. “There is tremendous potential for this type of product,” says People’s Leasing chief D P Kumarage. The issue called ‘Sukuk’ will be structured with the help of Islamic finance specialist First Global Securities and Investec capital. In the first tranche the firms are hoping to raise between 250 to 500 million rupees. “The meaning of ‘Sukuk’ is that it is a Shariah compliant bond or an Islamic bond, which is issued in a securitized basis,” Muhammed Thowfeek, managing director of First Global Group said. People’s Leasing says it has already built up a portfolio of around one billion rupees of Shariah compliant assets which could be securitized. The Colombia branch of the Deutsche Bank has been appointed as the trustee to manage the securities issue. In recent years the global Sukuk market has grown and Thowfeek says a surge is expected in 2008 as Shariah compliant banks seek capital to match the assets. In the 2007 third quarter alone, around 77.3 billion dollars of Sukuk issues had taken place which was double the amount compared to the same period of 2006. A recent estimate by rating agency Standard and Poors said the demand for Islamic finance would increase to four trillion dollars in the next five years. Thowfeek says Sri Lanka could use the process to raise funds for large infrastructure projects. First Global says even ‘sovereign Sukuks’ could be issued. First Global says the market remains untapped mainly due to the lack of awareness and attitude that Islamic finance is confined to Muslim or Islamic countries. Habiba is a graduate of Brunel University where she earned an LLM in European and International Commercial Law in addition to a Postgraduate Diploma in Legal Practice from The College of Law, London, before joining GMB Publishing as an Editor-Analyst. Bringing an array of legal experience from international internships, and a multicultural background coupled with fluency in South Asian languages, Habiba is involved in commissioning content for GMB Research, liaising with global contributors, and project managing a number of book publications. Roderick Millar has many years’ experience as an author and editor. After gaining an MBA in Madrid he has specialised in personal finance, business start-ups, development economics and recently management education. He has been editor of several Global Market Briefings titles, including Doing Business with… France, Germany and India. He is author of the Daily Express “Complete Guide to Family Finance” and “Start-up and Run Your Own Business.” Currently he runs IEDP.info, the executive development website. 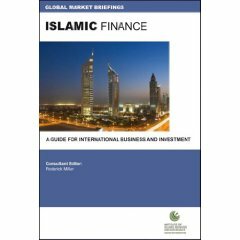 This timely guide to Islamic financial practice is aimed at banking professionals and corporate investors worldwide. With similarities to ‘ethical investment’ in the West, Islamic investment is based on socially-responsible principles excluding areas such as gambling, alcohol, weapons and products that are high-risk / high-return. Islamic and conventional banking have converged in recent years and investors and asset managers have become increasingly attracted to financial products and the institutions that adhere to Shariah principles. The International Centre for Education in Islamic Education or INCEIF was set up by Bank Negara Malaysia (BNM) in March 2006 to serve as a catalyst in creating high calibre professionals for the global Islamic banking and finance industry. As an international centre of educational excellence in Islamic finance, INCEIF will develop talents including professionals and specialists in Islamic finance who are much needed to sustain market competitiveness and meet future challenges in the Islamic financial industry. • Facilitate the coordination, planning and implementation of human capital initiatives for the Islamic finance industry in Malaysia. INCEIF is supported by a highly qualified teaching faculty which comprises renowned international and local scholars in the area of Shariah and finance as well as Islamic financial services industry experts. The education philosophy of INCEIF is holistic, in that it balances academic learning with practical industry experience. INCEIF offers professional certification programmes in Islamic finance by adopting unique andragogical approaches using a combination of online and onsite learning including attending seminars and tutorials. This means easy access to learning materials and tutorial guidance online, as well as able to interact with INCEIF’s teaching staff and other candidates via an active student support online network. INCEIF will also forge strategic alliances with domestic and foreign academic institutions as well as the central banks of the world to offer the combined strength, resources and expertise for global collaboration in training and education in Islamic finance. Part I: Building knowledge through basic knowledge in Islamic finance from theory and ethics to wealth planning and management. Upon the successful completion of examinations, project papers and coursework, candidates are given the Associate Member status. Part II: Building skills where candidates will obtain the required skills handling operational issues and Islamic financial transactions. Candidates have the option of specialising in specific areas of Islamic banking and/ or takaful. To be conferred as Proficient Members, candidates have to pass examinations and complete coursework. Part III: Building competency and experience through articleship programmes, including a six month internship at Islamic financial institutions. Candidates will undergo practical training under the direct supervision of a practitioner and upon completion of the articleship will be conferred the CIFP Practicing Member status. The CIFP programme can be completed between a minimum of one and a half years and a maximum of six and a half years. In addition to CIFP, INCEIF will also offer specialised post-graduate programmes, namely the Masters and Ph.D. on highly specialised fields of Islamic finance.